"Fates and Furies" generated a ton of buzz. I'm pretty sure I first heard about this book all the way back in January, and it was just released in September. 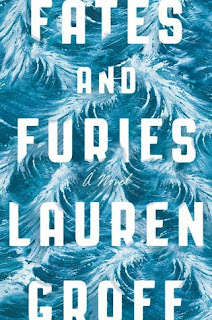 Lauren Groff is known for several previous novels, including "Arcadia" and "The Monsters of Templeton," but this was my first of hers. Lotto and Mathilde have been married since their last semester of college. Each is the product of a tumultuous upbringing, though in different ways unbeknownst to the other. The novel traces the story of their marriage, first from Lotto's perspective, then from Mathilde's. Lotto finds success and acclaim as a playwright; Mathilde supports him in his career, ever the dutiful wife. The novel moves gradually forward in time, flashing back from Mathilde's perspective to fill in background on some events we initially see only from Lotto's point of view. Lotto observes the great paradox of marriage - "You can never know someone entirely. You do know someone entirely." Groff spends the novel exploring that gap - how it's created, its impact on the couple and those around them. Who are Lotto & Mathilde really? Is our true self who we believe ourselves to be, or who our partners know us to be? It's a deep book, tackling the questions of who we are among all of our secrets and hidden histories; why we choose to hide certain things from our partners; and whether our partner's perceptions of us can drive us toward kindness, greatness, and the best version of ourselves. Throughout reading the book, I waffled as my interest waxed and waned. Yet, like many books this year, the last two or three chapters grabbed me and shifted my perspective on all that preceded them, such that the book as left a lasting impression. As a bonus, the audio narration is great, and the themes of Greek tragedy woven throughout are complementing my reading of "The Secret History" quite nicely. "Fates and Furies" by Lauren Groff, published September 15, 2015 by Riverhead Books. Audio narration by Will Damron and Julia Whelan, published September 15, 2015 by Penguin Audio.